Nice report,Jeff.Looks like a day that could do with a repeat. Bryozoans, crinoid stems with bryozoam coating, and a rugose coral. NIIIIIIIICEEEEEEEEEE bryozoans.I think that's Archimedes in there. Thanks. Yes, that's Archimedes, probably the most distinctive fossil from the Mississippian. Glad to add it to my collection. 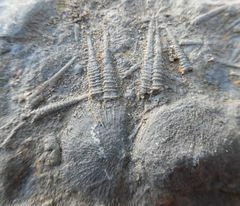 A lot of the crinoids, brachiopods, and corals were encrusted with bryozoans. I've seen quite a few bryozoans in Devonian and Ordovician sites near where I live, but not nearly so many as were present here. Really nice report Jeff and the fossils are Great! Glad you had such a productive trip can't wait to see some of those in person..... I really like the Blastoids very cool. Nice finds, Jeff! It's always nice to venture into the unknown and to come up with some new stuff for the collection, isn't it? Aren't we lucky to have Herb here? Glad you had a nice trip meeting up with family, and hunting the Mississippian! Thanks for posting this report! Great stuff! I always love reading your reports. Nothing like getting in some collecting while traveling. Very nice report and finds! Jeff, I enjoyed collecting with you and your nephew. Great company, great weather and great collecting. Looking forward to your next visit to hit some Ordovician sites. Welcome to the Mississippian! Looks like you had a good trip! Great Report Jeff and I agree that Herb is a great guy to collect with. You found a lot of little stuff so you must have been on your hands and knees all day! Nice bryozoans. I'll have to find some, somewhere, someday. If you visit that first site you would find some within 10 seconds. See the picture above of them all over the ground. I've never seen bryozoans that plentiful. Thanks Chris, Roger, Tim, Greg, Tony, Herb, Jim, Dave, and JPP for the nice comments and support. Herb, definitely want to check out some Ordovician sites next time. Best wishes all. A bit of fossil hunting, especially with another forum member, always makes a good trip even better. Thanks for posting your terrific finds, Jeff. Those blastoids are wonderful. Then you need to go explore some Fairview formation in Kentucky or Ohio. Ordovician aged bryozoan garden! Dave, you're giving me more reasons to return. I already have plenty, but thanks. The crinoid calyxes arrayed around a coin are Agassizocrinus. Although this crinoid had a tiny stem in its early development, as it grew the stem broke off and the basals fused into a solid mass that acted as a weight to keep the crinoid anchored to the sea floor. Your specimens are all the fused basal part, which is how these fossils are most commonly found. Specimens with the redials and the arms are rarely seen. Thanks Don for the ID help. These new additions to the collection will take some time and effort to properly ID them all. Also appreciated the information about their natural history.